Anyone who has been reading Balancing Beauty and Bedlam for awhile, has heard the phrase 10 Minute Dinners in numerous posts. In fact, I’ve used that phrase for years and have mentioned launching my new site for nearly as long. I started interacting on my Ten Minute Dinners facebook page back in August of 2011, and personally generated a lot of excitement in my own heart as I desired to help make meal time more manageable for all of us. And yet, I waited. I talked. I dreamed. I planned the whole site in my head, but I never executed a thing. I made an entire checklist of things that I wanted done before I launched the new site, but as life got in the way, I kept putting it off. I was paralyzed. I finally realized that I wanted to launch it with a bang, and in my mind, it wasn’t close to being Good Enough. My checklist determined that I would not go live until I had at least two people to help with the site, have 30 posts written so that the blog was populated with new recipes, and had executed a specified marketing campaign that would correlate with the launch date, so that lots of new traffic would be generated. Guess what? I committed to launching 10 Minute Dinners on October 1, and as the date approached, the site wasn’t ready, and none of the items on my checklist were checked off. I finally determined that with my schedule, and the actual extra time I had allotted to blogging, in my mind, I would never be “ready”. It would never be perfect, but it was definitely Good Enough. If I procrastinated any longer my dream would never become a reality, so following the theme of this month, I launched. 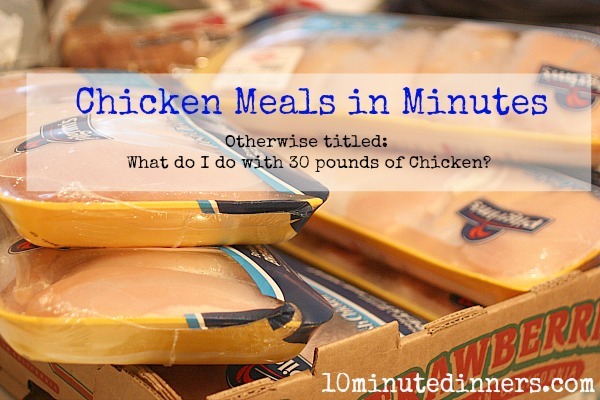 Yep, my 10 Minute Dinners site is live in all of its Good Enough glory. It’s slowly getting there. Links and categories will be fixed, and as I do life in my own kitchen, recipes will be added. It might not always have pinterest perfect photography or keep up with some of the other food blogs, but you know what? It’s a GOOD enough Thing, and the design is fabulous. It just makes me happy. My desire is that it will serve as a tremendous resource for many over the years, and if I’m being true to the goal of the site, spending two hours on the photography of a 10 minute dinner to make it look amazing, just isn’t reality. I’m not going to take the time to list all the posts, but you are missing out on two of my favorites. What Would You Do with 30 Pounds of Chicken? You all are going to drop your jaw when you find out how much I paid for 30 pounds of Chicken, and how I prepped it in just an hour. Have Mexican Meals ready at the snap of your fingers when you easily prep all the taco meat in your crockpot. With the pre-prepped Taco Meat, my easy Taco Soup whips up in minutes. It’s been a family favorite “dump and run” recipe for years. And we are actually going back to the basics with some simple tips for getting organized bycreating our own Meal Solutions Notebook to save our sanity. I hope you enjoy 10 Minute Dinners as much as I know I will. It’s helping keep me accountable in the kitchen and that is a GREAT thing. What have you been cooking up for Tasty Tuesday this week? I can’t wait to read all about it. Congrats on launching your new website Jennifer! I to am a horrible procrastinator sometimes, and could kick myself for waiting so long to start or finish a project once I actual buckle down and get it done. I wish you much success with your new site. Cooking meat in bulk is a life saver for me. By the way, I think your new site is lovely…more than good enough. I love your series this month. As a perfectionist, I get caught up in everything being perfect, but then I never do the things I want to do since I don’t have time to make it “perfect”. Over time, I’ve slowly realized that something that’s “good enough” is way better than nothing! And sometimes just starting is the hardest part for me because of my perfectionist paralysis. You had me at cooking ground beef in a crockpot…I NEVER KNEW YOU COULD DO THAT!!! 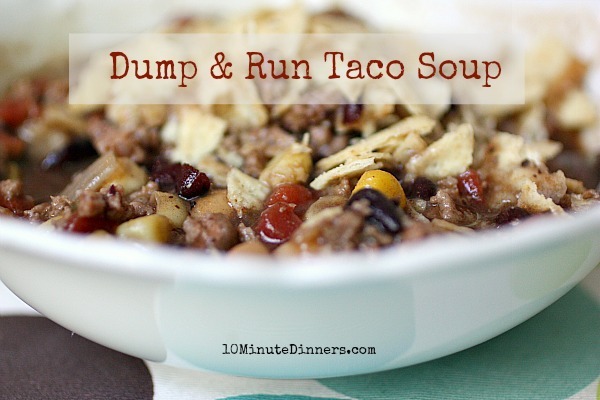 The Dump & Run Taco soup is in my crockpot now! I’ll let you know how it “rates” tonight! I can’t even begin to tell you how much I admire you!!! You are the most talented, down to earth woman, so full of wisdom. You are changing my life, making things easier! I love the concepts and the values you embrace. God bless you and your family. I am so grateful I found your blog. You are truly the hands and feet of God! I just can’t thank you enough for all you say and do and share with us. Love your new blog! I’m looking forward to learning so much as you “do life” in your kitchen…love it :)! And now your good enough thing is inspiring even more! You are an inspiration, Jen! It’s a *keeper* !!! Thanks for sharing! It’s impressive to have two blogs, both wonderful. It’s especially amazing to those of us who have never had the nerve to start even one. Keep up the good work.